Police officers are not soldiers. Despite a superficial similarity, both soldiers and cops wear uniforms and carry weapons, the skills and attitudes required to be successful in these professions are very different. A soldier is trained to kill the enemy. He often has to shoot first and analyze the situation later if he wants to stay alive. A soldier need not concern himself with the civil rights of his enemies. His job is to destroy them and win the war. A police officer, on the other hand, is trained to keep the peace. For him violence is the very last resort. His job is to protect civilians, not kill enemies. 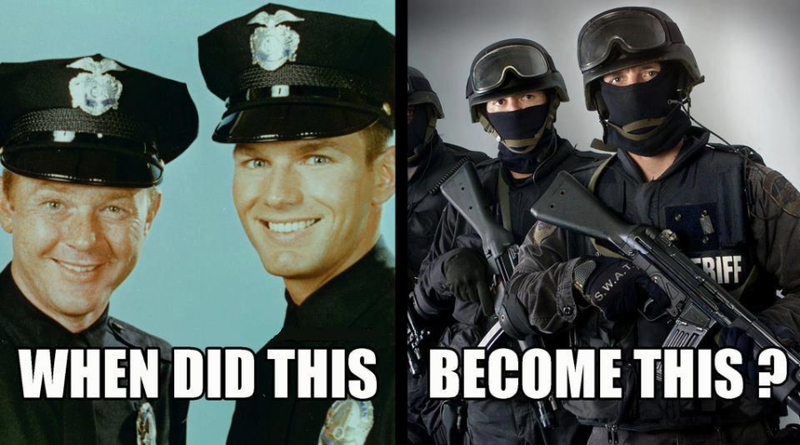 Why, then, are law enforcement personnel increasingly taking on the look and attitudes of soldiers? A SWAT team is meant to be used in emergency situations, when there is a hostage situation, an rampaging shooter, or a riot. There should be few cases in which a SWAT team is ever used and probably only larger jurisdictions really need one, particularly since small city police forces may not have the resources or personnel or properly train or equip a SWAT team. Why are SWAT teams increasingly found to be necessary by small town police departments and why are they being used to perform what ought to be routine, non-violent duties such as serving warrants or making arrests in drug possession cases or illicit gambling rings? Why are various federal departments using armed agents to enforce administrative regulations? The fourth amendment to the constitution prohibits unreasonable searches and seizures and guarantees that any searches and seizures cannot occur without a warrant issued after a demonstration of probable cause. Generally, this has meant that the police are not to enter a residence without knocking and identifying themselves as law enforcement. Why are no-knock raids complete with flash-bang grenades becoming ever more common and accepted as appropriate procedures? Why are there more and more cases of the police raiding the homes of innocent persons, injuring and perhaps killing people, without a word of apology or accountability? We are supposed to be a nation of equal justice under the law. How is it that police officers can assault and kill with impunity, can steal under the cover of civil forfeiture, and generally act as if they are above the law they are tasked to enforce? When did the friendly neighborhood policeman become the warrior cop? Radley Balko attempts to answer these questions in his book, Rise of the Warrior Cop. Balko traces the history of law enforcement in the United States from the beginning, noting that before the American Revolution and for the first few decades after independence there were no police forces in the United States or, for that matter in Britain. There were country sheriffs, but their role was largely serving court warrants. Law enforcement depended on social pressure in small communities and informal, volunteer town watches and posses. As the population grew and became more urbanized, it became necessary to adopt a more formal approach to law enforcement and the first police departments were organized in the 1830’s. This was controversial, both in America and Britain, as the political cultures of both nations were strongly against having a standing army of soldiers patrolling the streets and care was taken to make a clear distinction between the newly formed police forces and the army. This distinction began to become somewhat less clear in the twentieth century. Prohibition and later the War against Drugs with fights against well armed gangsters and later drug dealers seems to indicate a need for police officers to be more heavily armed, at least in certain special circumstances. The possibility that incriminating drug evidence could be hurriedly disposed of, seemed to make traditional procedures of knocking and waiting for a suspect to answer a door to be somewhat foolish. The upheavals and riots of the 1960’s showed a need for a heavily armed and specially trained task force, or SWAT agents, to handle extreme circumstances. Since the 1960’s, tactics meant to be used rarely and under specific conditions have become routine. If one is fighting a war against drugs, than the drug dealers are not simply fellow citizens who have committed a crime, but the enemy who is working to bring down the country. One does not concern oneself too much with the civil rights of the enemy in time of war. After 9/11, terrorism began to take the place of drugs as the enemy and justification for police departments around the country to acquire cool military equipment. There is much more to be said about this issue, and Radley Balko says it in his book. If you are at all concerned with civil rights, and our country’s slow erosion into a police state, than I highly recommend Rise of the Warrior Cop, though you may be surprised and shocked to learn how widespread and serious the problem of police misconduct has become. Balko lists many, many examples is his book. Some might accuse Radley Balko of being anti-police. He denies the charge and I believe him. As he notes, the vast majority of police officers are good people. The problem is not really the cops. The problem is that the system we have in place tends to reward the bad cops and to create incentives for even good cops to behave badly, particularly in the sense that often develops in police departments that it is us (the department) against them ( the criminals and increasingly civilians). Balko does make suggestions for reforms at the end of the book, and I hope that someone in a position to do something will heed his warnings.